This free service saves you money AFTER you book your room. If you’ve ever tried comparing hotel rates to find the best price, you’ve probably noticed rates change almost daily. Tracking rates over a given week can be time consuming, and most travelers don’t realize that, on average, 40% of all hotel reservations have a price drop after the first reservation is made. A free service called Pruvo ensures you never overpay for a hotel again. Here’s a quick look at how it works and how much you could save by using Pruvo. Pruvo is a free service that sends you price alerts on hotel bookings you've already made. If the price of the room drops after you book, you can re-book and save money. As long as you’ve booked a room that has a free cancellation policy using a website like Expedia, Booking.com and other travel booking engines, or directly through the hotel’s website, you are eligible for rebooking at a lower rate if the price changes. Pruvo monitors prices 24/7, and there’s no sign up or credit card required. Whenever you book a room and share your hotel reservation with Pruvo, they will track your reservation and let you know if you can rebook to save some money. How much can I save with Pruvo? The amount you can save with Pruvo varies by hotel booking and season. With Pruvo, you could save an average of $60 off hotel reservations made on any booking site or travel agency website. The great thing about Pruvo is you don’t have to create an account or log in to take advantage of Pruvo’s benefits. 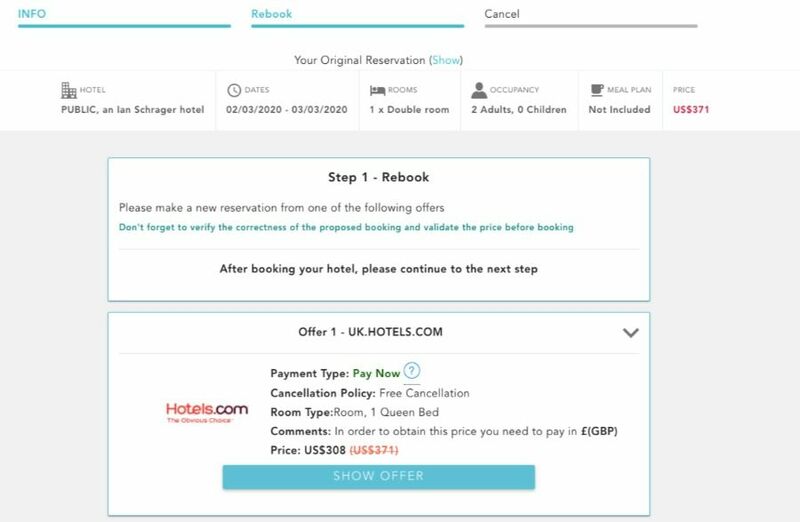 Here’s a quick step-by-step guide to using Pruvo so you can avoid overpaying for your next hotel booking. Book a hotel room (with free cancellation) directly through the hotel's website, through a third-party site like Expedia, or with an online travel agency. As long as your booking has a free cancellation policy, it will be eligible for a Pruvo review. Forward your hotel reservation (the email you receive after your reservation is made) to hotelpricedrop@financebuzz.com, and Pruvo will begin monitoring your hotel room for price drops. 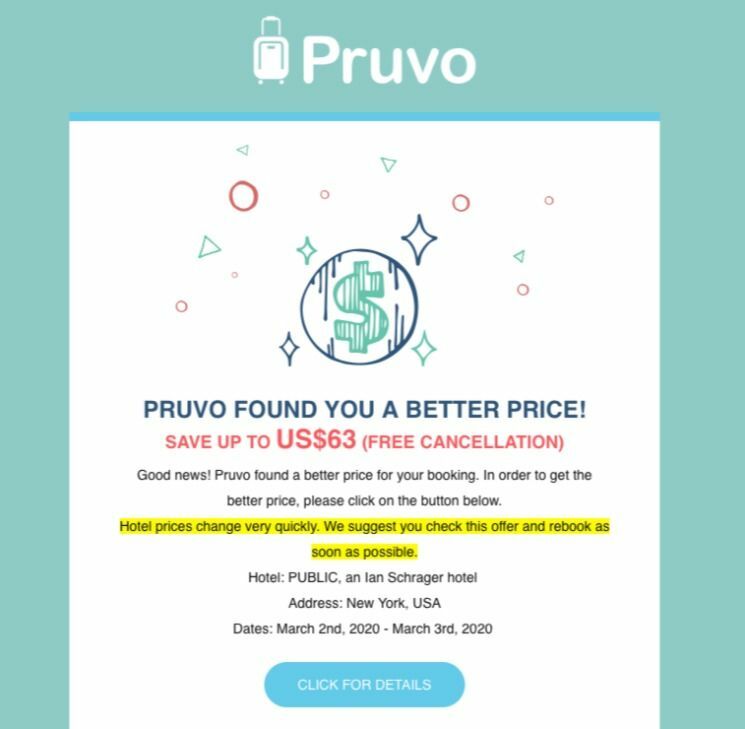 If Pruvo finds a lower price on the same hotel room before your stay, they will notify you via email immediately. Rebook at the lower rate. There are no extra fees or charges involved with changing your reservation with Pruvo. Pruvo takes care of all the details so all you have to do is follow the confirmation instructions. How much does Pruvo cost? This sounds too good to be true. How does Pruvo make money? Pruvo is an official partner of all major hotel room providers. Since they are an affiliate, they earn a commission from these websites. They don’t charge any fees to the users because they are paid through their partners. Can I still earn points through the hotel’s loyalty program? Your booking may not be eligible for loyalty program benefits because you booked through a third-party website. However, you can still wind up saving money when Pruvo finds a better rate and you end up rebooking at a lower rate. How often do hotel prices change? Room rates can change as quickly as the minute or hour because the hotel’s available rooms, or inventory, is always changing. When more people start booking a room, the hotel can charge more to meet the demand. When demand drops, hotels tend to drop prices to fill their rooms as quickly as possible. Ready to give Pruvo a try? Pruvo is a convenient service for anyone looking to save money on hotel bookings. Whether you’re a frequent traveler or go on vacation once a year, you could save an average of $60 per reservation or only pay up to 72% of the original booking price just by using Pruvo. If you’ve made a hotel reservation recently and want to try it out for yourself, simply email your reservation details to hotelpricedrop@financebuzz.com, and Pruvo will start monitoring hotel rates for you immediately. The service is completely free and could help you save money on your next trip.